So excited to be here on the Crafting Desert Divas Blog with you! Today I wanted to address the fear many have of watercolor...lol... especially when it comes to digis! You can admit it... you're a little afraid.. and I'm hoping I can make you feel more comfortable to give it a try! I used various forms of watercolor or faux watercolor on these and you can use all or none on a project, but I'm hoping you'll give them a try. 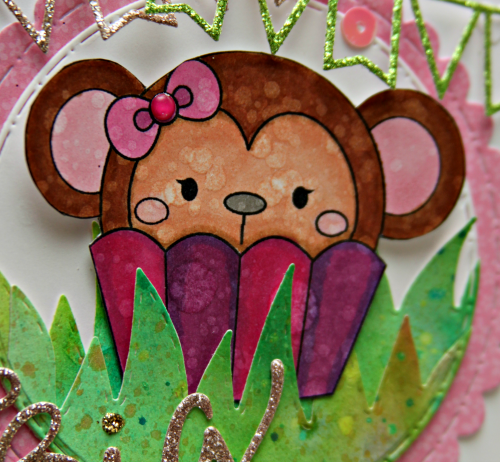 Links to all of the CDD products I've used are at the bottom of this post! I don't think I am the only one that fell in love with these Cupcake Cutie digis that are in the CDD shop! 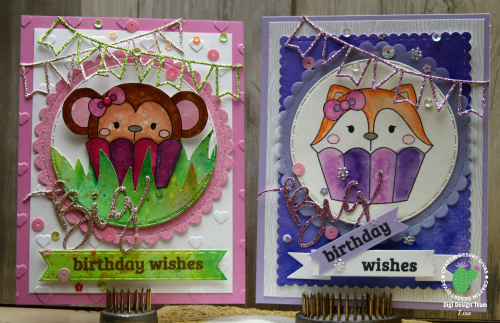 I know my fellow Diva, Jan has had much fun with them and you should check out all of her awesome designs! So.. a question raised amongst us was can you print a digi on watercolor paper and use watercolors with it! The answer is yes! I got my watercolor paper at Target in the kids' craft section. I chose it because it was not as thick and textured as some and as you can see my inkjet printed on it just fine. As always, I did print the night before just for good measure and I used just a basic quality print. Then the next morning I was able to use my watercolors to my hearts delight! 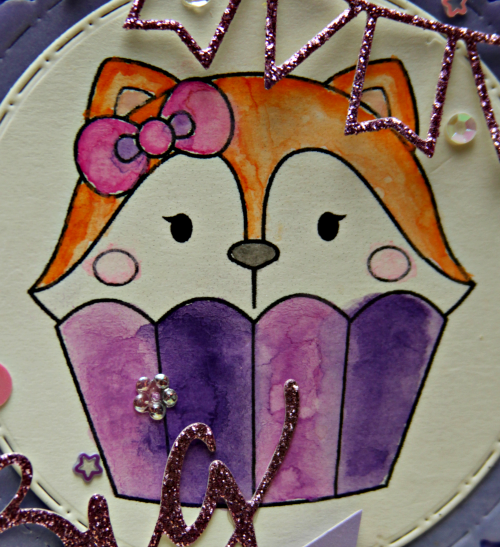 I love the soft look of watercolor on an image and with the larger areas on these Cupcake Cuties they are pretty easy to watercolor with. I used both a small and medium sized brush and just went light on the water. I do like to go out of the lines a little with the watercolor and let my colors mix a bit. It's not an exact science and I love it! Another option is to just do a watercolor background. Some Saturday mornings I'll get up and take my watercolor paper and watercolors with me downstairs and I'll just start making backgrounds. I'm not patient so making them while I'm creating a card is painful... dry time... so I make them up ahead of time in a variety of colors. I used the Fancy Frames die to cut it out and I love it. I just mixed all of my purples here and there and so often you won't like it until it dries and then ... oooh... magical! Here she is closeup... see... no worries about lines!! It's supposed to be a little imperfect! Just love the water lines and color variations. I also splattered a little bit of water on after she was dry to add more water lines. 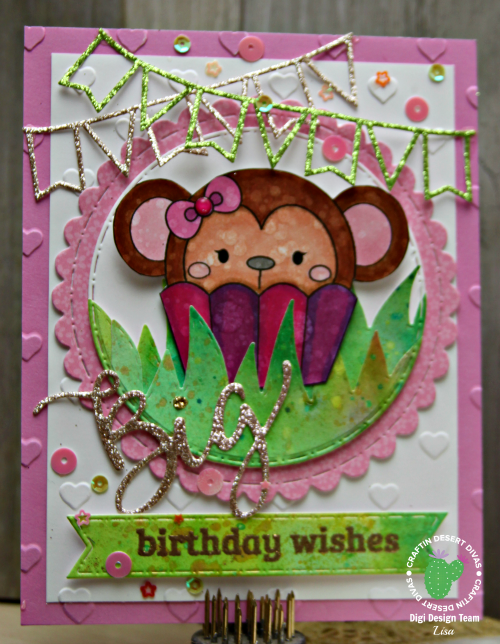 Note those pretty delicate banners from the Party Dies and that beautiful Wishful Thought Word Die "Big"! And here I also used one of my backgrounds I created ahead of time and cut some grass out of it using the Outdoor Landscape Dies... another way you can use up some of your watercolor creations that maybe you don't like the whole piece, but boy that bottom half is awesome! Use some dies and cut out some shapes with it... I also used it on the sentiment banner from the Flag Banner Dies. And up close... 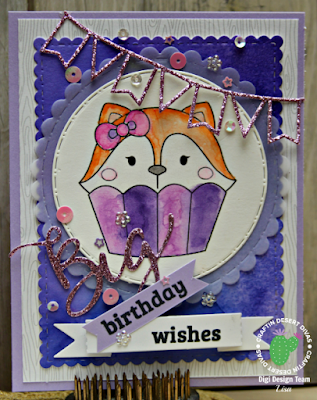 I really do love the splatters on this... these Cupcake Cuties are so adorable!!! So! Don't be afraid... give it a try... just one little addition to your piece with watercolor or a watercolor look can make such an impact! That is great to know you can get a watercolot effect with alcohol markers! I had no idea! I would love to be able to watercolour digis but my printer says no. Doesn't matter how long I wait or even if I use my heat tool. The minute the water hits it, it runs. Love your cards, Lisa, and I enjoyed reading about your watercolouring!